CHICAGO – Highly anticipated! In the latest HollywoodChicago.com Hookup: Film with our unique social giveaway technology, we have 40 pairs of advance-screening passes up for grabs to the darkly searing “Tracy Letts” comedy “August: Osage County” starring Meryl Streep! Based on Tracy Letts’ Pulitzer Prize-winning Broadway play of the same name, “August: Osage County” has already been nominated by the Golden Globes, Screen Actors Guild, BAFTA and just two days ago by the Chicago Film Critics Association for best actress (Meryl Streep) and best adapted screenplay (Tracy Letts). The film is a lock for recognition at the upcoming Oscars, too. The comedy, which is rated “R” and opens on Dec. 25, 2013, also features an all-star cast including Julia Roberts, Chris Cooper, Ewan McGregor, Juliette Lewis, Abigail Breslin, Benedict Cumberbatch, Dermot Mulroney, Sam Shepard, Margo Martindale and Julianne Nicholson from director John Wells (“The Company Men”) and writer Tracy Letts. To win your free “August: Osage County” passes courtesy of HollywoodChicago.com, just get interactive with our unique Hookup technology below. That’s it! This screening is on Tuesday, Dec. 17, 2013 at 7 p.m. in downtown Chicago. The more social actions you complete, the more points you score and the higher yours odds of winning! Completing these social actions only increases your odds of winning; this doesn’t intensify your competition! “August: Osage County” tells the dark, hilarious and deeply touching story of the strong-willed women of the Weston family. Their lives have diverged until a family crisis brings them back to the Midwest house they grew up in and to the dysfunctional woman who raised them. Tracy Letts’ Pulitzer Prize-winning play of the same name made its Broadway debut in Dec. 2007 after premiering at Chicago’s legendary Steppenwolf Theatre earlier that year. It continued with a successful international run and was the winner of five Tony Awards in 2008 including best play. 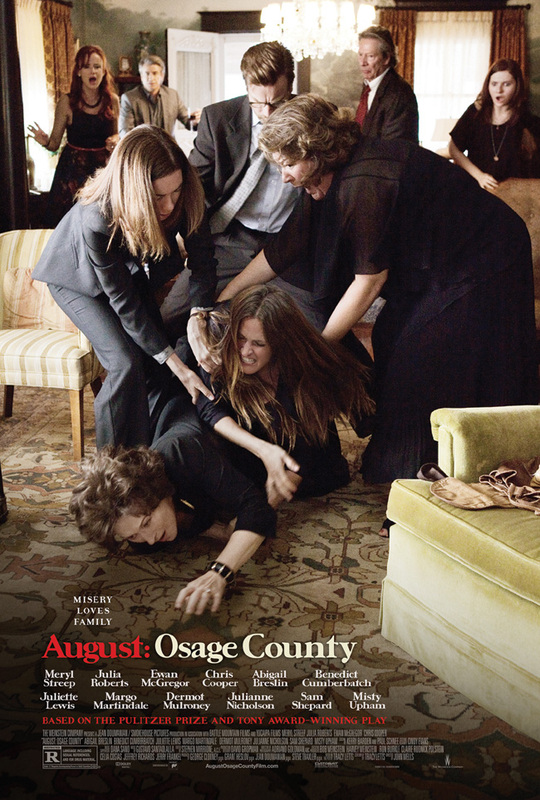 The movie poster for “August: Osage County” starring Meryl Streep and Julia Roberts from Tracy Letts. This HollywoodChicago.com Hookup is simple! Just get interactive in our unique Hookup technology above. We will award 40 admit-two movie tickets based on social entry numbers and/or randomly via e-mail for our “August: Osage County” Hookup. Good luck! Winners need to arrive early as seats are consumed on a first-come, first-served basis. Since showings are overbooked to ensure a full house, winners are not guaranteed entrance and must arrive early. We recommend arriving at least 45 minutes before the showing’s scheduled start time. HollywoodChicago.com LLC is a promotional partner with the studio and its partners and doesn’t assume any liability for this giveaway. HollywoodChicago.com is not responsible for errors or omissions entered in user submissions. Comments are closed in this Hookup.